Last year was defiantly the year of the vegan, one of the most talked about lifestyle choices. For the record, I am not vegan; however, my diet has become definitely less meaty. For sure I will still enjoy a good steak — I was out last week tucking into some of the most delicious Wagyu beef I’ve ever tasted, cooked to perfection. So why are we eating less meat? Many of my friends are well into week three of Veganary, post New Year resolutions — and they all have their reasons, be it weight loss or detoxing. Some other friends have made the switch to a predominantly plant-based diet. I’ve read that reducing the amount of meat we eat can dramatically impact the environment. I’ve also read many lifestyle features, welcoming in the new year with a close look at what we are going to be eating in the year ahead. Veganism is set to soar; it’s a food trend that I’m sure will continue to dominate 2019. Skimming the net for food news, I’m told eating in, is the new going out, which I think we may have heard before. Individual portions are so last year apparently, it’s now all about sharing. I’m not a fan of sharing food — not because I’m mean, but because growing up in a huge family we did a lot of it. On occasions, it was a race to the finish line to make sure you got the biggest slice or the most desired flavour. On the rare occasion we visited a fast food joint the same rules applied — no child would want to share a burger or eat half an apple pie, but we were on a budget. It’s something that has stayed with me. Of course, if I’m hosting I’ll happily share the food I’ve cooked. 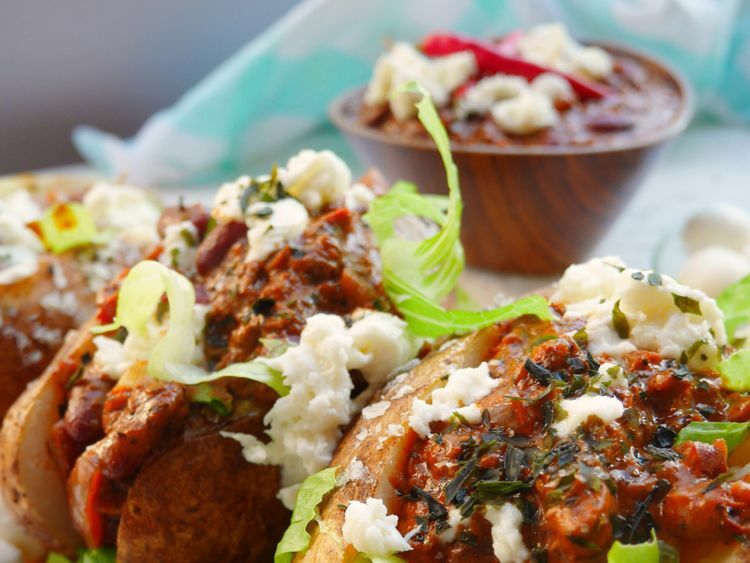 So this week I’ve created the perfect sharing dish, veggie chili and baked potatoes. Not ground-breaking for sure but it combines two of this year’s trends. There are a few things in life I’ve never done. To the surprise of my friends I have never seen ‘Dirty Dancing’, or cooked chili. I have no explanations for both of these life moments. So what better way to welcome in the new year then whisk up, with a few alterations, a vegan/veggie chili? In the recipe alongside, I’ve used coarsely chopped mushrooms that when cooked have the texture of beef (many of my veggie friends don’t eat mushrooms for precisely that reason). You will need a big chopping board and a sharp knife, otherwise chop the mushrooms in batches. A great dish for freezing and of course sharing, I’ve served this recipe with some crisp leaves and torn mini mozzarella balls. Switch these to a vegan version if that’s what you’ve signed up for this month, and if veganism is set to continue throughout the year, this is the perfect sharing recipe. 1. Preheat the oven to 180 degrees, wash and dry the potatoes. Coat with oil and sprinkle with rock salt. Bake for 45-60 minutes until crisp. 2. Next, heat the butter in a shallow pan, add the chopped mushrooms and saute until soft. Remove from the heat and set to one side. 3. In a separate pan heat some oil and saute the onions and garlic. 4. Season then add the chopped tomatoes, dry herbs, spices, stock cube, tomato puree, Worcester sauce (or the vegan alternative) and chocolate. 5. Bring to the boil, then turn down the heat and simmer for five minutes. 6. Next, add the mushrooms and kidney beans, stir and simmer for further 15 minutes. 7. Finally, check the taste, add more spice if needed. 8. Place the potatoes on a serving board, cut and split, add the lettuce, chiLli, top with torn mozzarella and serve.